Haba makes some great kids games. 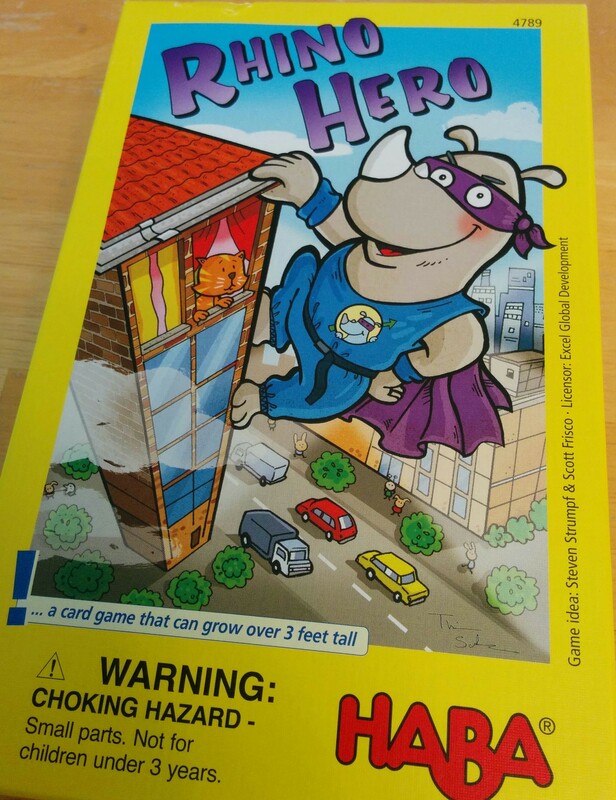 One of my favorite is Rhino Hero (also known as Super Rhino), it’s one of those rare activities that kids like but can be fun for adults as well. The game contains two types of cards: wall cards that have a crease in them to allow them to bend easily and roof cards that have lines on one side to show how walls need to be placed. Roof cards can also have a special icon that modifies game play (reverse direction, skip a turn, get an extra turn, etc.) 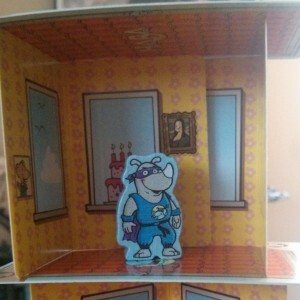 or requires a player to move the Rhino Hero. The eponymous hero is a wooden meeple that starts out on the table but must be moved whenever a roof with his symbol is played. Each round you place walls according to the roof card the last player placed before playing a roof card of your own. The game requires basic strategic thinking as well as concentration and good coordination as the tower grows. 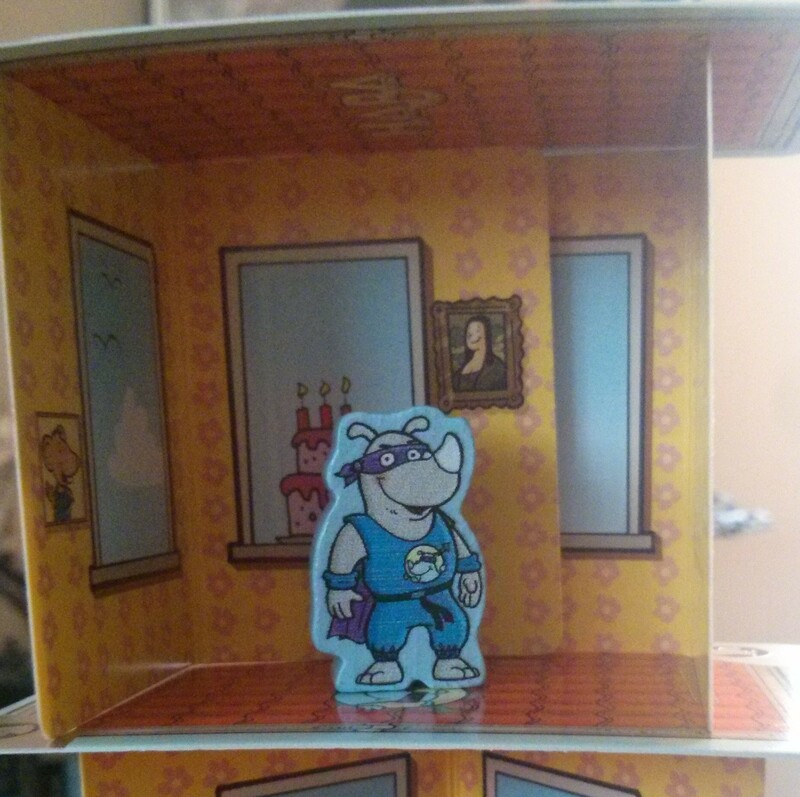 The goal of the game is to use all of your roof cards first, without knocking over the tower. The game says for ages 5+, but my four year old cousin loved it so much when I brought it to play over Christmas that I bought him a copy for his birthday. My six year old son and seven year old cousin both love it as well. Whenever I ask Thing 1 if he wants to play a game, Rhino Hero comes out about half the time. We’re just over a week into Blaugust, for more details on what it is go check out the Blaugust Initiate Page.